1. Do all the rooms have views? 2. Are you child friendly? Yes, The back of the complex has a wonderful BBQ with a terrific grassed area for the children to play with parental supervision. There are child locks in second bedroom for peace of mind. 3. If your first level is second storey, how do mature people or people with babies handle the stairs? The design of Baywatch is such that you can park under the building or drive to the elevated rear of the complex (bypassing 17 stairs) where you enter the lower apartments at ground level. 4. How far from the water are you? Baywatch is approximately 60 metres from the water and 200 metres to the nearest bay beach at Spencer Park Here you will find BBQ, facilities play ground, safe swimming area snorkelling or just a lovely area in which to simply relax, sunbake or read a good book? 5. Are you close to most attractions/ facilities? 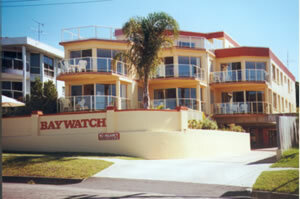 Baywatch is approxiamately a 180 metre flat walk to the RSL & 280 metres from the centre of town, bowling club, cafes, resturaunts, shops. Most gests do not use their cars after checking in, unless they wish to visit areas out of town. Baywatch is a short distance to all local churches and beautiful beaches for an outdoor wedding with stunning photos. With only 6 apartments all have a large corner spa solid brick walls to ensure limited noise and privacy. 7. Do you have internal web access & phones? 8. Is the location/ Main Street noisy or hectic? Main Street ia a T-intersection, located at the top of Market Street (Market Street is the town,s central street where the majority of shops can be found). If you turn left at this intersection you will head towards the supermarket and major roads. If you turn right, Baywatch is only approximately 200 metres on the left. Continuing past Baywatch leads to Short Point and Long Point peninsular which is therefore a low traffic area. 9. Do you have discounts, seniors or off season rates? 10. How far is Baywatch from the airport. Baywatch is a short drive from the airport, if you advise us of your flight details we can arrange to pick you up on arrival.